What Makes for Great Screen Recording Software? Screen capture software simplifies everyday tasks such as submitting or responding to support tickets, announcing product updates, onboarding new employees, or creating software tutorials. Of course, the process doesn’t end with the screen recording. The quality of the final product can make or break user engagement, so we also considered the post-capture editing features as we selected the best video recording software. 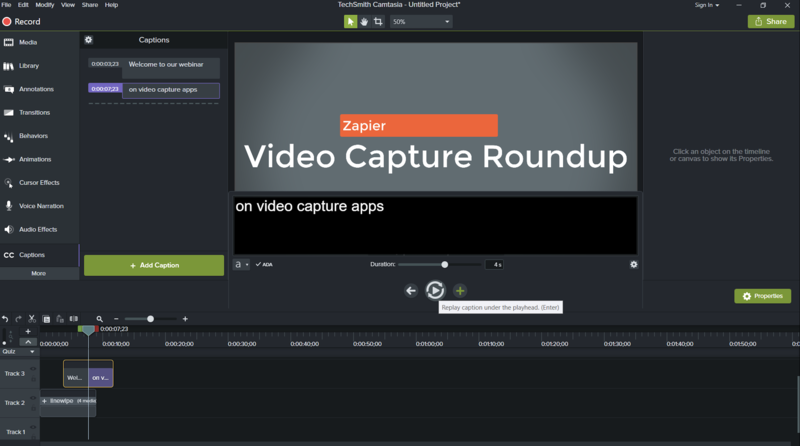 The Camtasia video capture interface is straightforward and no-nonsense. You choose your capture area, whether or not to include webcam and microphone inputs, and click Record. Its built-in video editor is a different story. There’s an exhaustive list of editing options that manage not to feel overwhelming. Click-and-drag effects and a decent selection of stock media are located along the left-hand side of the app, with detailed properties and customizations appearing on the right-hand side whenever you select an element from the timeline. Camtasia provides outstanding tutorial videos for anyone that struggles with its editing tools, but creating surprisingly professional intro and outro segments and dropping them into our test video took a matter of seconds. Our only hiccup was with the interactivity features, which allow you to add quizzes or clickable buttons to your project. Configuring these elements was easy enough, but previewing the video and exporting the final product was noticeably more complicated after adding interactivity. This is also the only app we tested with a closed captions tool that loops audio while you add the text. A four-second segment plays until you’re done typing, and then you can press Tab, and it plays the next loop. Camtasia Pricing: $249 for a lifetime business license for up to two machines. If you need to share lots of short screen recordings but don’t need a bunch of editing bells and whistles, you can’t go wrong with Screencastify. For example, if you provide customer support, you’re probably less interested in polished videos with long production turnarounds than you are in quick and easy screen captures. 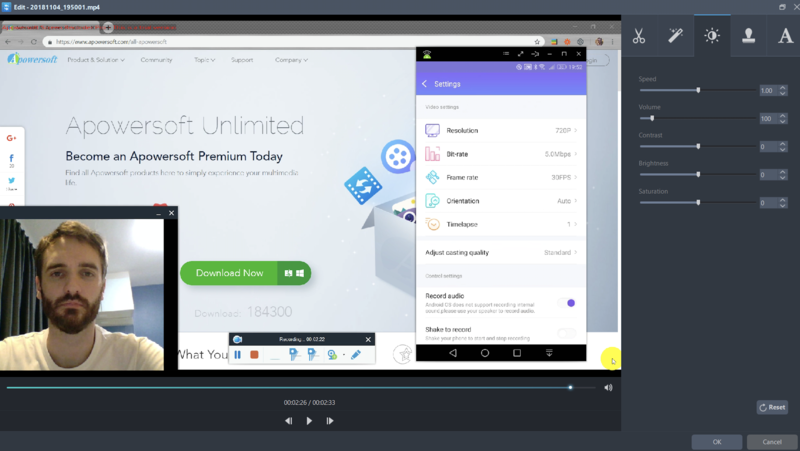 Screencastify trades in the editing options for an uncluttered desktop recording and video sharing interface. Since it’s a Chrome extension, you can set everything up in one to two minutes. Install it, choose what you want to capture (Screencastify can capture video outside of your browser window), enable or disable webcam and microphone capture, and click Record. 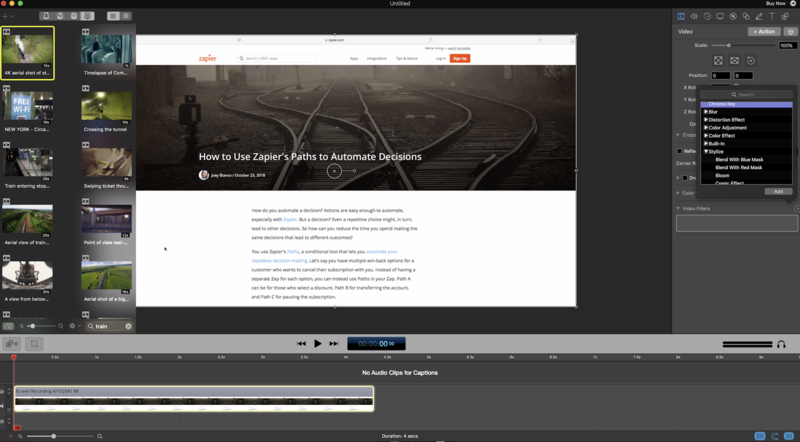 During a recording, Screencastify positions a toolbox in the lower left corner of your browser that includes cursor settings (toggling the focus bubble, adding click animations, and auto-hiding the cursor when it’s inactive) as well as a paintbrush to annotate content within a Chrome window. When you stop the recording, Screencastify opens the video in its web player and uploads the file to your Google Drive or YouTube account depending on how you’ve configured it. Click Copy Link if the content looks good as-is, or choose from the trim, split, or merge tools before publishing. Screencastify Pricing: Free for up to 50 videos per month that include a watermark and are shorter than 10 minutes; $24/year for unlimited recordings with no length restrictions, no watermark, and the ability to export videos as MP4 or GIF. What OBS Studio lacks in editing features, it makes up for with streaming and recording options. For starters, the open-source app lets you create customizable “studios,” preset audio and video configurations that you can cycle through during a recording. 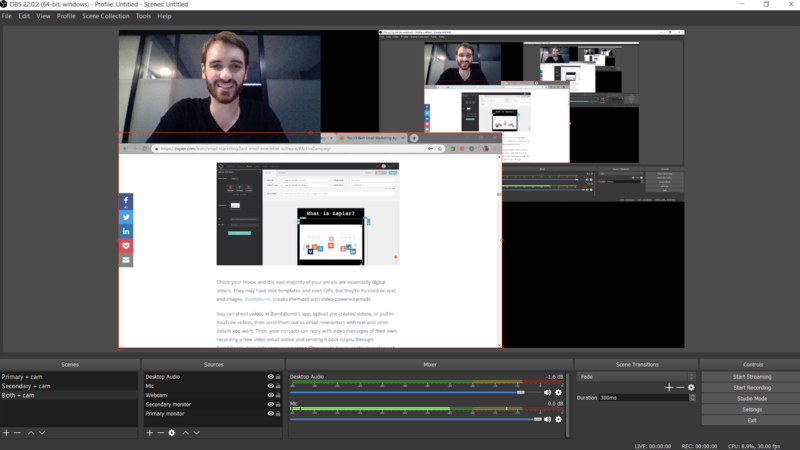 We created three studios during our test (shown above): one for just the primary display and webcam, another for the secondary display and webcam, and a third for both displays and the webcam. Sizing and positioning elements within each studio is a simple click-and-drag affair, and cycling through them during a recording session is controlled with a hotkey. With enough preparation, these audio and video presets eliminate the need to fuss with any settings while streaming live video via OBS’s robust integrations. There are 44 (!) platforms in the live streaming menu, ranging from big-name sites like Facebook, YouTube, and Twitch, to obscure streaming platforms like watchpeoplecode.com and Sermon Audio. Opening the Settings menu and pasting your stream key into the text box is all it takes to set up the one-click Start Streaming button on the main dashboard. Changes you make to a studio, such as sound mixing or webcam placement, are broadcasted live, so make sure you’re ready. Any up-to-date Android device or iPhone has a built-in screen recorder and some basic video editing tools. But for those who need more functionality, Apowersoft’s Unlimited package has a lot to offer. It includes subscriptions to all 17 Apowersoft apps (eight of which handle some sort of video capture or editing) that can be launched from a single dashboard. There’s one app for recording an Android screen and another for iPhones, both of which include settings we didn’t see in any other apps, like resolution control, bit-rate throttling, framerate selection, and camera configurations. If you have Apowersoft’s Unlimited suite, you can wirelessly cast a mobile device to your computer screen and use the desktop recorder to capture your computer’s webcam, microphone, PC audio, and mobile device simultaneously. This is especially convenient if you want to show someone how to use an app that has a desktop and a mobile version. If there are similar features with dissimilar interfaces, showing them side-by-side would clear up any confusion. The suite’s video editor is pretty basic, but it will let you trim segments, add text overlays, and adjust contrast, brightness, and saturation. Apowersoft Unlimited Pricing: $59.95/year for Personal plans; $99.95/year for Business plans. You can also buy the individual products at lower rates. Telestream’s ScreenFlow adds a wow factor to your screen recordings, but it does have a steeper learning curve than other options on this list. Although its editor looks minimalistic at first, there’s an overwhelming number of features to sift through. By far the most valuable of these tools is Telestream’s stock media library, which includes more than 500,000 images, audio clips, and videos (some in 4k) to put a professional sheen on your screen recording. Open the in-app library from the Features pane, search by keyword, then click and drag the media to your timeline. Access to the stock media library is $60 per year, which is well worth it if customers or large audiences are watching your videos. Other standout features include the ability to record your desktop at retina resolution (i.e., very high resolution) as well as some impressive templating options for cutting down on production time. The Styles and Templates tools allow you to group settings and video components so they can be applied with a couple clicks. With Styles, you can save audio/visual settings for individual elements like color filters or drop shadows for a video segment. Templates lets you insert, arrange, and configure groups of elements in advance, such as branded intro and outro segments, text placeholders, and background music. ScreenFlow Pricing: $129 for a lifetime license. Loom looks similar to Screencastify, but it’s unique enough to earn a spot on this list. The most obvious difference is a minimalistic control interface that replaces Screencastify’s annotation toolbox. If you enable Loom’s webcam capture, it will be attached to the control interface as a floating bubble that can be moved or resized within a browser window. Other browser-based screen recorders display the webcam feed in a separate window, and the Loom approach is much easier on the eye. The only drawback is that things can get a bit messy if you want to keep the webcam visible when capturing video outside of the browser. Another tiny but nice detail is the ability to pause and resume recording, which isn’t as universal among screen capture apps as you might expect. When you’re done recording, the video is uploaded to Loom’s cloud storage, and—as of this writing—all users have unlimited video storage. That’s a huge benefit for anyone who creates a lot of support-related screencasts and has to keep a close eye on how much available cloud storage they have left. Loom does include a tool for trimming the beginning and end of your capture, as well as dead air in the middle, but that’s it. 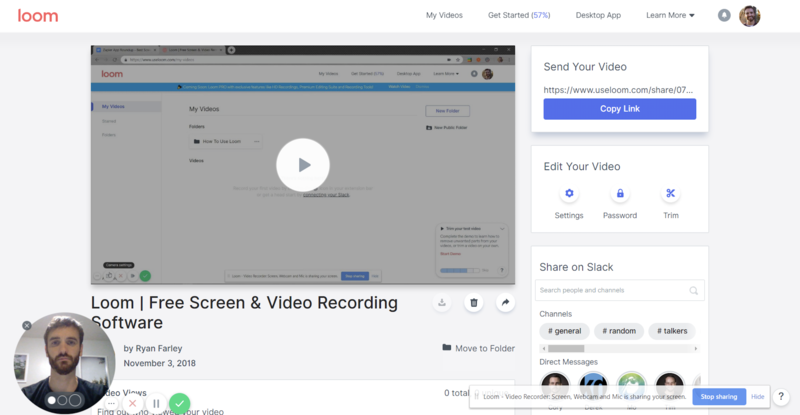 When everything is finished, there’s an integrated Slack feature for sharing videos to specific groups or users without leaving the Loom dashboard. Anyone who receives a link to your video can click the link to watch it in a convenient web player that lets them mark specific moments with emoji reactions. From the admin dashboard, you can password protect videos, download them as MP4s, and review where users left emoji reactions. Movavi Screen Recorder Studio is a great mid-level screen recording app, complete with a built-in editor that gets the job done. But there is one feature it does exceptionally well: scheduled captures. This tool lets you record webinars or live streams while you’re away from your desk. Just open Movavi, choose the capture area in the screen recording interface, click the alarm clock icon in the upper-right corner, and schedule the capture. You can start manually and end after a custom duration or choose a start and end time based on the system clock. You can even set it up so your computer shuts down or goes to sleep after the capture is finished. It’s convenient and unambiguous, further improved by Movavi’s above-average resolution settings. If you need to record an inconveniently-timed webinar to share with others, you’ll want it to look good. The video export functions are bizarrely specific, with options broken down by device manufacturer. Is there really a difference between playing on an LG 4k TV and Samsung 4k? We’re not convinced that level of specificity is necessary, but it’s there for anyone who wants it. Movavi Pricing: $59.95 for a one-computer lifetime license. With the rise in popularity of eSports, most of today’s screen capture software programs include gamecasting features. That’s not useful for productivity-minded workers, but high-resolution video capture—like that available with Bandicam—works wonders for those in creative fields. If you’re putting together a Photoshop tutorial or a webinar on web design, 144 frames per second in 4k resolution will ensure your content stands out from the rest. Bandicam requires top-notch hardware to process recordings at such a high quality, but most people in the creative field shouldn’t run into any problems. Although you might expect a complex interface from an app that focuses so much on video quality, this app has a sparse configuration window. It’s a dead-simple app, and the only thing it’s missing is a built-in editor. Bandicam Pricing: $39 for a one-computer lifetime license; $29.50 for each additional computer. 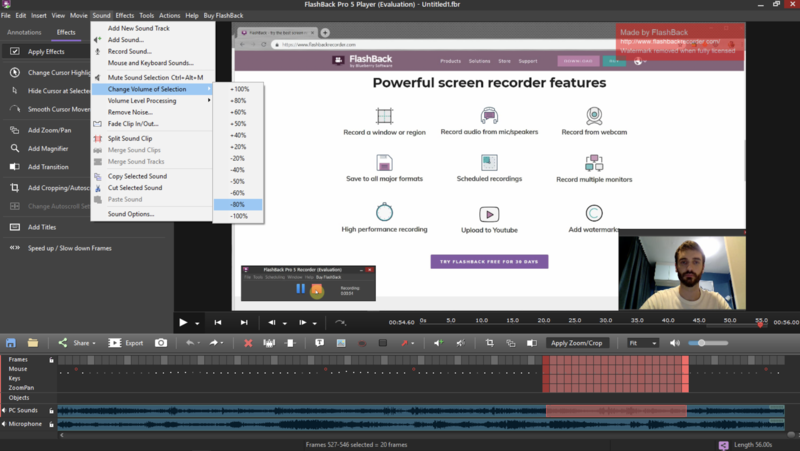 The FlashBack Pro screen recording interface looks a bit dated, and the editor is only a couple steps above average, but it comes with invaluable sound editing tools. Recording your voice during a desktop capture creates lots of tiny issues. The proximity of keystrokes to your mic make them sound like a jackhammer, unwanted noises from across the room are hard to prevent, and system audio is often at a totally different volume than your mic. Most editors help you minimize these problems, but none are as detailed or easy to navigate as Flashback Pro. For example, turning down the volume on a system audio track is as simple as highlighting it on the timeline, right-clicking it, and choosing Change Volume of Selection. You can also remove background noises by applying a filter, or normalize microphone and PC audio so their volumes match. The app also has a couple of novel video editing features, such automatically highlighting sections of screen inactivity for removal and re-recording your mouse cursor without changing anything else in the video. FlashBack Pro Pricing: $49 for a lifetime home license; $79 for a lifetime business license. It didn’t seem as though Atomi’s ActivePresenter 7 would make the cut in the early stages of our testing. Starting a video capture is straightforward, but options are limited, and getting it to work on a secondary monitor took some extra effort. Things didn’t get any easier in the editor. This app combines the familiar layout of PowerPoint’s slides with timeline video editing. On the left side of the screen are a number of slides, and within each slide is a unique timeline with its own mixture of video and interactivity elements. The layered approach to project progression seemed unnecessarily complicated at first, but it’s likely the easiest way to create interactive screen captures. 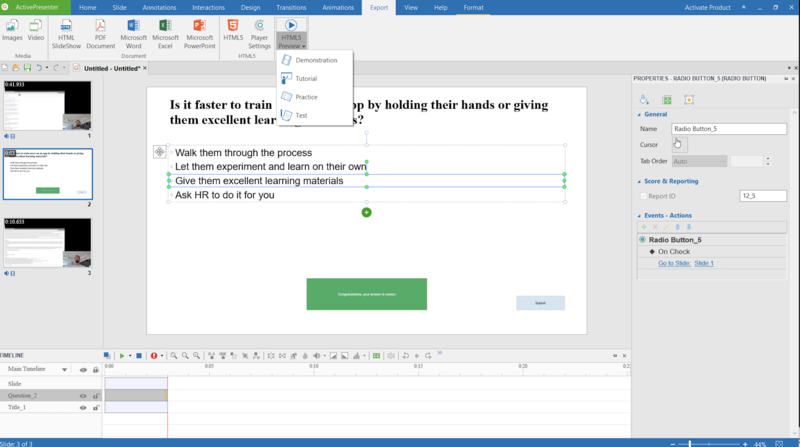 Having said all that, among the few apps we tested with interactivity tools, ActivePresenter 7 is the only one that lets you playtest your quizzes and activities without exporting the entire project and opening it in a separate learning management system. To try it out, record a screen capture and add all the annotations and animations you want. Then click the Interactions tab from the ribbon along the top of the screen, and select from elements such as True/False or Multiple Choice. This will create a new slide where you can create a question, add options for answers, and configure conditional outcomes. For example, when viewers answer a question correctly, send them to the next slide; if they answer incorrectly, you can send them back to the beginning or let them try again. It takes some getting used to, but you should be able to create an interactive training course within an hour. Click the Export tab and select HTML5 Preview to test the course in a web browser. If everything works well, you can export it as a SCORM, xAPI, or HTML5 file. ActivePresenter 7 Pricing: $199 for a lifetime Standard edition license; $399 for a lifetime Pro edition license, which adds all the interactivity features. 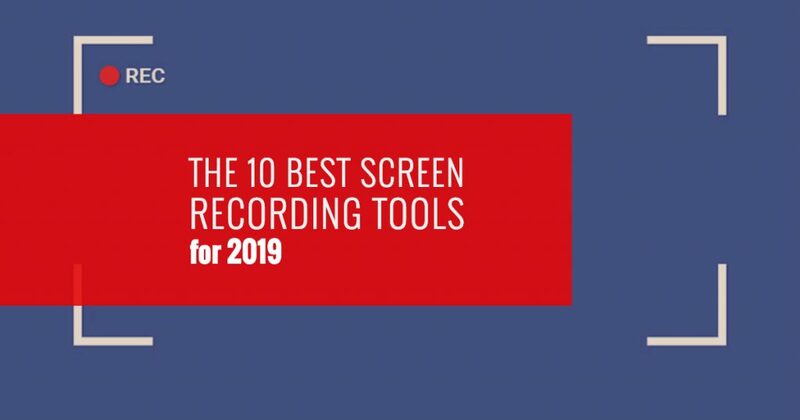 The best screen recording software is the one that saves you the most time and produces the most worthwhile content for your audience. Make sure you know your target audience and use case before selecting an app. All the options we’ve listed are either free or come with trial versions, so give your top contenders a whirl, and see which you like best.